URBANA, Ill. – When humans get bacterial infections, we reach for antibiotics to make us feel better faster. It’s the same with many economically important crops. 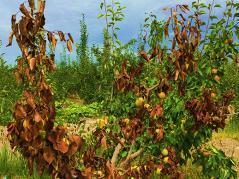 For decades, farmers have been spraying streptomycin on apple and pear trees to kill the bacteria that cause fire blight, a serious disease that costs over $100 million annually in the United States alone. But just like in human medicine, the bacteria that cause fire blight are becoming increasingly resistant to streptomycin. Farmers are turning to new antibiotics, but it’s widely acknowledged that it’s only a matter of time before bacteria become resistant to any new chemical. That’s why a group of scientists from the University of Illinois and Nanjing Agricultural University in China are studying two new antibiotics—kasugamycin and blasticidin S—while there’s still time. “Kasugamycin has been proven effective against this bacterium on apples and pears, but we didn’t know what the mechanism was. We wanted to see exactly how it’s killing the bacteria. If bacteria develop resistance later on, we will know more about how to attack the problem,” says Youfu Zhao, associate professor of plant pathology in the Department of Crop Sciences at U of I, and co-author on a new study published in Molecular Plant-Microbe Interactions. The bacterium that causes fire blight, Erwinia amylovora, is a relative of E. coli, a frequently tested model system for antibiotic sensitivity and resistance. Studies in E. coli have shown that kasugamycin and blasticidin S both enter bacterial cells through two transporters spanning the cell membrane. These ATP-binding cassette (ABC) transporters are known as oligopeptide permease and dipeptide permease, or Opp and Dpp for short. The transporters normally ferry small proteins from one side of the membrane to the other, but the antibiotics can hijack Opp and Dpp to get inside. Once inside the cell, the antibiotics attack a critical gene, ksgA, which leads to the bacterium’s death. Zhao and his team wanted to know if the same process was occurring in Erwinia amylovora. They created mutant strains of the bacterium with dysfunctional Opp and Dpp transporters, and exposed them to kasugamycin and blasticidin S. The researchers found that the mutant strains were resistant to the antibiotics, suggesting that Opp and Dpp were the gatekeepers in Erwinia amylovora, too. Zhao and his team also found a gene, RcsB, that regulates Opp and Dpp expression. “If there is higher expression under nutrient limited conditions, that means antibiotics can be transported really fast and kill the bacteria very efficiently,” he says. The researchers have more work ahead of them to determine how Opp/Dpp and RcsB could be manipulated in Erwinia amylovora to make it even more sensitive to the new antibiotics, but Zhao is optimistic. The article, “Loss-of-function mutations in the Dpp and Opp permeases render Erwinia amylovora resistant to kasugamycin and blasticidin S,” is published in Molecular Plant-Microbe Interactions [DOI: 10.1094/MPMI-01-18-0007-R]. Additional authors include Yixin Ge, Jae Hoon Lee, and Baishi Hu. The work was supported by a grant from USDA’s National Institute of Food and Agriculture.